The international meetings December 3-14, 2007 in Bali, Indonesia aimed to develop the road map to guide negotiations to create a legally binding framework for the post 2012 Kyoto period. In Bali, the parties aimed for a 'mandate' that describes what the next phase of Kyoto will look like and what the deadline will be for completing negotiations. It is critical that there be no gap between the end of the first Kyoto commitment period and the beginning of a post-2012 agreement. The next two years [2008 & 2009] will be crucial in determining whether the international community is able to stop climate change. 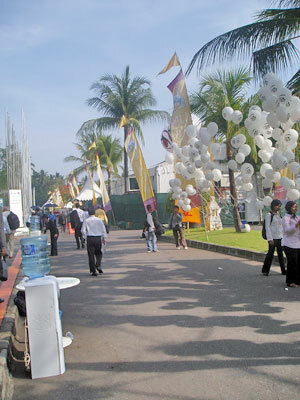 The Climate Change Conference in Bali, December 2007 should set the wheels in motion for a negotiation over the next two years. The greatest issue at stake in Bali is whether countries will take on deeper commitments under the Kyoto Protocol's architecture, and continue to expand the carbon market it has created, in the second commitment period. To avoid a gap between Kyoto's first and second phases (the first one ends 2012), we need a new binding treaty by 2009 at the latest. This would allow three years for countries to ratify the agreement. Deeper absolute targets for Annex I countries: 30% below 1990 levels by 2020 and 80-90% below 1990 levels by 2050. The United States, Australia and Canada must do their fair share, and that includes making up for lost time. New, absolute reduction targets for some newly industrialized countries, such as South Korea, Singapore, Saudi Arabia, Kuwait and Mexico, and their inclusion in the Kyoto emission trading regime. possibly take on emissions intensity targets as well as renewable targets. An adaptation mechanism to ensure that the most vulnerable countries have the necessary support to adapt to the level of climate change that is unavoidable. Kristin Bingeman, Manitoba Wildlands Research Manager is attending the Bali Conference, as part of Climate Action Network Canada delegation. We will be posting her updates and photos here. The Bali climate negotiations were supposed to end Friday, December 14th, but spilled into the evening of Saturday the 15th, finally concluding amidst high drama. The 190 countries worked overtime to agree to a 'Bali roadmap' to guide activities over the next two years. The main document is the Bali Action Plan, which applies to all countries and launches negotiations for a post-2012 global climate agreement or amendment to the Kyoto Protoccol to be guided by scientific analysis of emission cuts needed to avoid dangerous climate change. 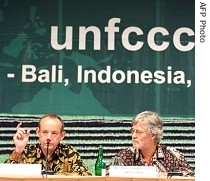 The Bali outcomes include an agreement that sets a range of further emission reduction targets for the 38 industrialized countries that agreed to targets under the first phase of the Kyoto Protocol (The conclusions adopted by The Ad Hoc Working Group on Further Commitments for Annex I Parties under the Kyoto Protocol (AWG)). an agreement to tackle the problem of deforestation in developing countries. The Bali Action Plan proclaims that "deep cuts" will be required in global emissions of greenhouse gases to respond to the "urgency" of the global warming crisis. However, to the disappointment of the European Union and others, including the NGO community, the text does not specify targets, leaving that issue for negotiations over the next two years. The agreement was softened to satisfy the United States. The Bali Action Plan talks nearly collapsed at the last minute when India and China insisted on stronger promises by wealthy countries to help provide "green" technology to developing nations. When tougher language was added to the agreement, the United States refused to accept the deal - sparking a wave of criticism from almost every other nation at the conference. Speaker after speaker demanded the U.S. not be allowed to kill the deal single-handedly. Under immense pressure, the US capitulated and accepted the language, allowing the deal to go ahead. The agreement reached by the Ad Hoc Working Group on Further Commitments for Annex I Parties under the Kyoto Protocol (AWG) set targets for deep cuts in emissions by the 38 wealthy countries that have ratified the Kyoto Accord, including Canada. The United States has not ratified Kyoto, so was not represented in negotiations on this agreement. There were, however, suggestions that Canada was acting for the US in opposing binding targets. In the final negotiating session, Canada's Environment Minister John Baird spoke against the ambitious target for wealthy countries to cut greenhouse gas emissions by 25 to 40 percent by 2020. But with support only from Russia, he found himself virtually isolated, withdrew his objection, and agreed not to block the consensus position. This sparked a lengthy burst of applause from other countries. This significant step means that the richest countries - all except the US - have now set ambitious new targets for emissions reductions. Minister Baird's withdrawal of Canada's objection to more stringent targets for wealthy countries may have been influenced by the almost 100,000 Canadians that signed an online petition during the last few days of the Bali negotiations, calling on Prime Minister Harper to stop obstructing UN climate change talks in Bali. Overall, the Bali negotiations resulted in an agenda for the key issues to be negotiated for the post 2012 Kyoto period. These are: action for adapting to the negative consequences of climate change, such as droughts and floods; ways to reduce greenhouse gas emissions; ways to widely deploy climate-friendly technologies and; financing both adaptation and mitigation measures. 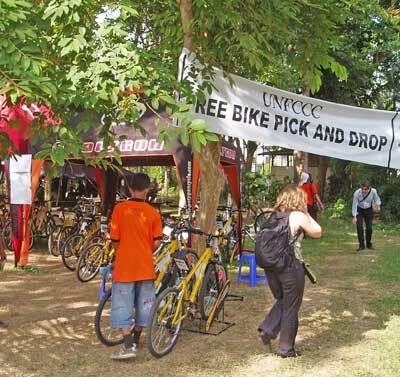 The December 2007 UNFCCC conference in Bali was attended by approximately eleven thousand participants, among them the Secretary-General of the United Nations and six heads of state. Hundreds of civil society participants attended, including over 50 Canadians. Youth delegates from around the world provided commentary in awarding the Fossil of the Day award, and monitoring the words and actions of their countries' negotiators.